e live in an increasingly violent world, learning self-defense is a must: We know that personal safety is important to you and your family. The selection of a self-defense school for you and your family is a very important decision and should not be taken lightly.There are several important reasons why you should consider Pinewood Karate as your martial art school.Pinewood Karate focuses teaching the most effective techniques:The first reason is that Pinewood Karate will teach you the very best in self-defense in a comfortable and safe, family atmosphere.While other schools teach flashy kicks delivered with high spirit, they cannot prepare you for a violent street altercation. While high spinning kicks may look good, they are not effective against a determined attacker. At Pinewood Karate, we understand the difference between “flashy techniques” and what really works. Students at Pinewood Karate are taught, from their first day of class, vital self-defense techniques. They are trained in counters to the most common attacks and muggings. Students are taught to get free from a choke as well as to release themselves from wrist and clothing grabs. Students are taught break falls and throws on a padded mat. Our goal is to build character in every child: We do not attend competitive tournaments or award our students six foot plastic trophies. Our goal is not to create one champion by trying to determine who is best. Instead, the black belt instructors at Pinewood Karate concentrate on developing in each child character, confidence and self-discipline. Unlike other schools, we have avoided turning our school into childcare. Instead, at Pinewood Karate, we focus on teaching self-defense which will build confidence and self control.Pinewood Karate’s outstanding heritage was not created overnight:Our teaching methods are not new. We teach only time-proven methods that have been honed for centuries. Pinewood Karate’s lineage of outstanding martial art masters has been well documented back to the year 1761. The ancient techniques, taught exclusively at Pinewood Karate, have been shown to be the most effective methods of blocking, neutralizing and countering a violent attack. At Pinewood Karate, our methods are based on proven techniques that utilize leverage rather than size or strength. This means Pinewood Karate is ideal for everyone but especially effective for women and children who need protection the most. Pinewood Karate is the most established martial art school in the Napa Valley. 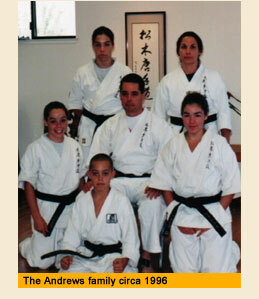 Since 1989 Pinewood Karate and the Andrews family has been helping Napa kids grow up Safe and Strong. Pinewood Karate has earned an international reputation for excellence:We are proud to say that our students have helped Pinewood Karate earn an international reputation for excellence. Students from other countries such as Canada, France, Poland, Russia, Mexico and India are currently training in Pinewood Karate. In addition to the martial art aspect of Pinewood Karate, we also offer a unique program to train martial artists as healers. This program is know as Black Belt Healers and is exclusively taught at Pinewood Karate. Currently martial art students from around the world are training in this outstanding course. Pinewood Karate is the only martial art school in the Napa Valley to be voted in the Top 200 schools in North America.We are so very proud of our Pinewood Karate students: Our Pinewood Karate students are serving overseas in the United States military, in law enforcement as well as serving the community in various fields of endeavor.We are proud to say that a very high percentage of our black belts continue their formal studies in colleges and universities. Students report back to us that their training in Pinewood Karate helped them immensely as they continued their educations and started their careers.As you can see, Pinewood Karate is much more that just the most effective self-defense. Pinewood Karate is a family martial art school devoted to “helping Napa kids grow up Safe and Strong”. We would like to help you and your family with the many benefits of training at Pinewood Karate. Call us today to make an appointment for a Free Trail Lesson. We look forward to seeing you at Pinewood Karate real soon.